The right dumbbells help you maximize your weight lifting routine. Choosing an appropriately sized set of dumbbells is important for ensuring that you reach your fitness goals. Many sporting goods stores sell sets that allow you to progress to heavier weights as you gain strength. The right size dumbbell for you is likely to vary from that of a friend or family member. Following guidelines for making the selection right for you is the first step to establishing an effective and efficient weight-training routine. When you choose your dumbbells, perform a set of repetitions to determine the ease of finishing. 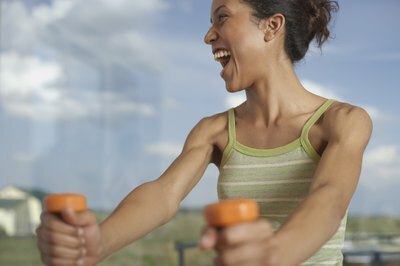 In general, use your dumbbells to do 12 repetitions of a specific move. For example, do 12 bicep curls. If you have the right pound load, finishing the last repetition may be difficult, but you should be able to do it with proper form. If this is too easy, you have likely chosen a dumbbell that is to light. If you can't squeeze out the last couple repetitions without compromising form, the dumbbell is too heavy. Experiment with a variety of sizes to help you find the one that fits you best. Your fitness goals play a role in finding the right size dumbbell, according to the American Council on Exercise. If you simply want to improve your overall fitness, choose a weight that allows you to complete one or two sets of 12 to 15 repetitions. If your goal is to get stronger, choose a pound load that lets you do two to six sets of four to eight repetitions each. If you want to increase your endurance, the appropriate dumbbell allows you to do two to three sets of 12 to 16 repetitions. The pound load is going to be different for each scenario, and you may need to have several sizes on hand if you have several of these goals. As your muscles grow and your routine gets easier, you are probably ready to increase the pound load of your dumbbells. Use the same technique you used to determine which weights to start with. Do a set of 12 repetitions with a higher weight and determine if it works for you. 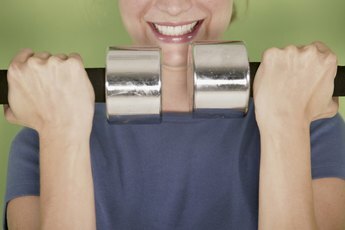 MayoClinic.com suggests starting out with a light weight as your body gets used to lifting weights. For example, start with a 5-pound set of dumbbells and move to 8-pound dumbbells after several weeks. Most gyms offer a wide range of dumbbells, which makes it easier to find the size you need. If you prefer to lift at home, consider purchasing a few sessions at a gym to try out the dumbbells for help finding the right fit. Dumbbells are made from several types of material, including metal, rubber and plastic. Despite the right size, you might find that you can't keep up with proper form using a specific material. In addition to testing out the size, test our a variety of types so that you can maximize each dumbbell session. Once you determine the right fit, purchase a set for home use. American Council on Exercise: When Weight Training, Is It Better to do More Reps With Lighter Weights or Fewer Reps With Heavier Weights?